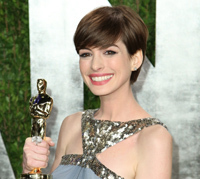 Fresh from her Academy Award win for her role in Les Miserables, Anne Hathaway is set to re-team with her The Dark Knight Rises director Christopher Nolan on his next project, Interstellar. Deadline reports that she’ll star opposite the recently-confirmed Matthew McConaughey. Hathaway can be seen coming up in Joseph Gordon-Levitt’s directorial debut Don Jon and will then provide a voice in the animated sequel Rio 2.